MJ Medical will provide specialist medical equipment consultancy services for the project, working as part of the multi disciplinary design team. In addition to producing the necessary detailed technical equipment content, specifications and costs, MJ Medical will continue to appraise the opportunities to enhance the hospital design to accommodate operational efficiency and future flexibility. A focus will be placed on enabling the incorporation of innovative and cutting edge technologies both at the point of first occupation and throughout the buildings lifecycle. It will be MJ Medical’s continuing role to ensure that the design team has technical appraisals and design criteria for all items of equipment and in particular the specialist medical imaging and nuclear medicine technologies. Work on site is due to start shortly after the project reaches financial close, which is expected in January 2014. The hospital is expected to be the country’s largest when it opens in 2017. The new hospital will be built next to the existing hospital, which will be demolished once services have been transferred. 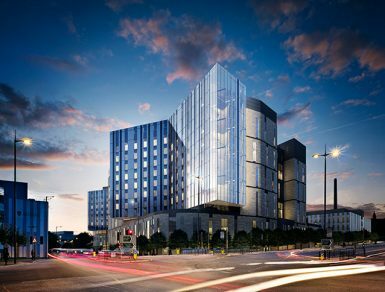 The new hospital will be the largest in the country with 646 beds, including a 40-bed Critical Care Unit, 18 operating theatres and one of the largest emergency departments in the North West.